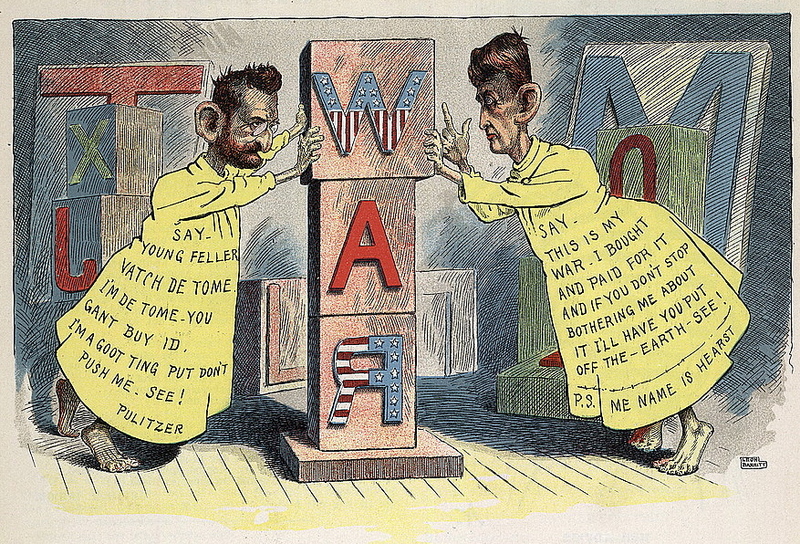 At the end of the nineteenth century Joseph Pulitzer and William Randolph Hearst were engaged in a battle to attract readers to their respective newspaper empires. In 1893 Pulitzer purchased a four-color press with the idea that the Sunday New York World would include reproductions of famous paintings and architecture. But the results were unsatisfactory; the technology and expertise required for matching printed color to original art were still in the future. An editor then convinced Pulitzer to use the press for the comics supplement, including Richard Outcault’s popular “Hogan’s Alley.” One of Outcault’s minor characters was a street urchin and, when the paper began printing the comic strip in color in May 1895, an ambitious press operator who had been unhappy with the previous attempts at yellow used a solid wash of ink for the boy’s shirt. “The Yellow Kid” immediately became the strip’s most recognizable—and most popular—character. In 1896 Hearst, who had purchased a color press for his own company, lured away Outcault, along with a good number of the World’s employees, to the New York Journal, in order to publish a competing full-color Sunday supplement, billed as “eight pages of iridescent polychromous effulgence that makes the rainbow look like a piece of lead pipe.” Although Hearst had won the cartoonist, Pulitzer still owned the copyright to “Hogan’s Alley”—and so both papers carried their own versions of the Yellow Kid. The two publications became known as the Yellow Kid papers, soon shortened to the “yellow papers.” And thus was born “yellow journalism”—the term coined by New York Press editor Erwin Wardman for the sensationalistic news and headlines featured in the World and the Journal. 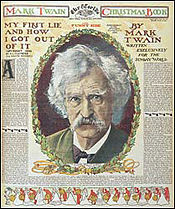 Notes: Twain makes passing reference to the Dreyfus case (page 440), which had dominated headlines for several years. Captain Alfred Dreyfus, a Jewish staff officer assigned to the French ministry of war, was convicted in December 1894 of spying and sentenced to life in prison—a verdict widely supported by the anti-Semitic elements of society. Over the next five years, in a series of events too complicated to summarize here, evidence clearing Dreyfus came to light but was suppressed by the war ministry, a letter incriminating him was forged, and the forger later confessed—yet Dreyfus was convicted again at a second trial. 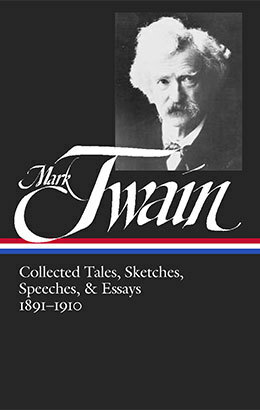 He received a presidential pardon shortly before Twain wrote this essay. Twain also refers to Joseph Chamberlain, who had been accused in involvement in the unsuccessful attempt in 1895 to overthrow the Boer government in South Africa. The House of Commons cleared Chamberlain in 1897. The quote by William Cullen Bryant on page 444 is from “The Battle-Field”; the Thomas Carlyle quote is from The French Revolution. “Lay of the Last Minstrel” (page 445) is a poem by Walter Scott (not Milton), and George Washington’s brother Edward is a figment of Twain’s imagination. The mention of Chicago is shorthand for the World's Columbian Exposition (or World’s Fair) of 1893. As I understand it, what you desire is information about “my first lie, and how I got out of it.” I was born in 1835; I am well along, and my memory is not as good as it was.. . . . If you don't see the full selection below, click here (PDF) or click here (Google Docs) to read it—free!